Retail investors have basically stopped buying tokens. When they do, the average ticket amount is now at around 500$. The jolly days of 2016–2017 when “the people” were standing in line to buy tokens are nowhere to be seen. So, we are now at the phase where more security tokens are being sold, and mostly to institutional and qualified investors. until the day when new, more startup-accomodating securities laws will be introduced- the crypto startup market will follow the footsteps of traditional finance world by becoming an exclusive golf club. for this reason I’m introducing the term STPOs- Security Token Private Offerings. This is to distinguish what goes on inside the golf club from what goes on outside of it. When securities laws will make it feasible for crypto startups to sell tokens to retail investors- then the term STO will be appropriate. The most important legal factor about STPOs is the PPM- the private placemet memorandum. this memorandum is the contarctual basis of the relationship between the token seller and the investor. the PPM is the most viable type of document to be used when privately selling tokens, and I seriously recommend you to stay away from SAFTs and other kinds of home-made or lawyer-made inventions which usually come without any approvals from regulators or courts. This means using them is esentially a gamble. The PPM contains an intro to the company selling the securities, lists the risks the investment entails, described the securities being sold and the terms under which they are being sold. 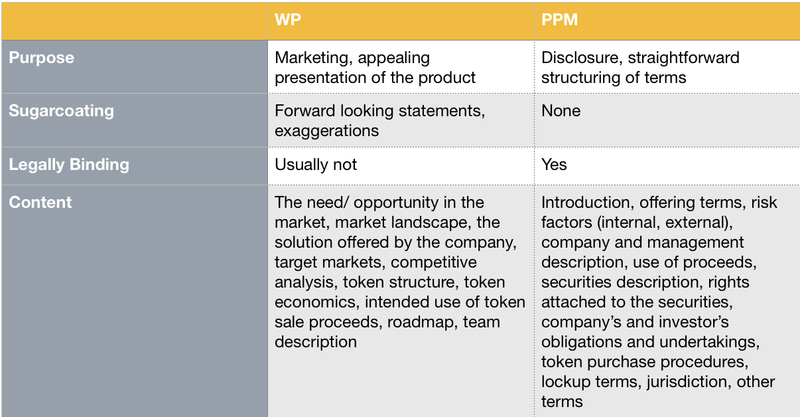 let’s briefly examine the main differences between a white paper and a PPM. The PPM needs to represent the rights of the investors in a precise way. Maybe now is the time to go over the types of securities which are usually sold to investors by regular startups, and the types of security tokens which are presently common. Common shares (“common stock”)- the most common form of company shares. usually grants voting rights (inferior to those of preferred shareholders). In case of liquidation, common shareholders can claim their share of a company’s assets only after debts to debt holders and preferred shareholder were paid. Preferred shares (“preferred stock”)- this is the kind ofstock usually issued to outside investors. they grant special rights and privileges, more powerful voting rights and anti-dilution restrictions. These shareholders can claim their shares of a company’s assets before common shareholders do. Convertible notes start out as debt securities (bonds), and then convet into equity (shares), usually at the same time a future round takes place. through them, an investor can loan money to a startup and then be repaid not with principal + interest, but with shares according to an increased discount rate, in return for the risk he/she took investing in the pre-money stage of the company. if that day never comes and the company is liquidated, the invetsor will be the first to be repaid- before shareholders. Short, flexible and comprehensive securities. numerous forms exist, including SAFEs (the inspiration for the SAFT) and crowd notes (usually meant for crowd sales through crowdfunding exemptions). Equity tokens- represent shares in the company. usually come with voting rights, liquidation rights and dividend rights. Dividend tokens- similar to class d preferred stocks. entitle the holder to a pro-rata share of the company’s profits. do not represent equity and do not grant voting rights. Performance tokens- tokens which do not represent ownership in an asset, rather have their value pegged to the performance of an asset. the asset can be anything from a currency, a precious metal, an oil drilling facility or a mine owned by the company, and so on. It is basically a derivative. Tokenized assets- tokens representing actual ownership rights in an asset. the rights are absolute and do not depend on a counterparty. Good examples are intellectual property, and real estate assets. Each ST type entails different risks and has different characteristics. common legal and coneptual frameworks for ST types are still premature, and that means issuers and investors need to be extra meticolous when drafting and signing a PPM.